Following the positive response to my question as part of the Better Care Closer to Home consultation meeting, I have met with Steve Allinson, Chief Officer of North Derbyshire Clinical Commissioning Group (CCG) and we were shown round both Spencer and Fenton wards to see the wonderful and effective care they offer to the residents of High Peak. Thank you very much to the staff who spoke with us and I know that Steve was impressed. I appreciate that this is a very difficult time for staff and families, especially as it has just been announced that Riverside Ward at Newholme Hospital in Bakewell will be closing next week on 23rd August. Riverside Ward had few patients, and was struggling to recruit staff, so it is a very different situation from the wards at The Cavendish which are fully utilised. The Trust which runs the hospitals has announced that a pilot Dementia Rapid Response Team (DRRT) will be set up in the next few weeks. I have asked for clarification as to where this pilot group will operate, which staff roles will be involved, and how its effectiveness will be measured. I have also asked for the difficult position of staff to be recognised and as much support as possible to be given to them. Their skills, experience and commitment are vital to both current and future patients, and all the NHS bodies must strive to ensure that staff are informed, involved and supported. The CCG has committed to run a Rapid Response Team alongside the provision at Spencer Ward to see whether it will be effective at reducing the need for the dementia assessment and support role provided by the Ward. Whilst I would be very pleased to see support offered to more families who are struggling to care for a loved one suffering from dementia at home, I am concerned that the new provision for more seriously ill patients to be cared for at Walton Hospital in Chesterfield has not taken into account the impact of long travel distances for family and friends of patients. This will not only cause huge distress for patients and their families, but will mean that patients cannot be supported to gradually return home for their ongoing care, which helps families stay together wherever possible and reduces the costs of care. I am therefore supporting the complaint submitted by High Peak residents challenging the decision making process by the CCGs involved. 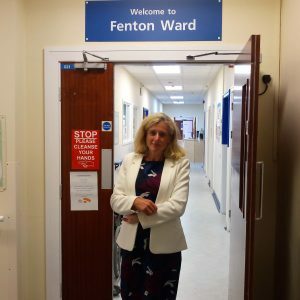 Whilst we have been assured that cost is not a factor in the decisions on Spencer and Fenton wards, they must be put into the context that the CCG is in a very difficult financial position, having to find £27.3m savings – over 6% of their total budget. I appreciate the work that is being done by the CCG to try and achieve the level of cuts demanded by NHS England with the least impact on patient care. I have offered my support to persuade the Department of Health to seek fewer cuts to be required immediately. Through all the uncertainty, one thing is certain – our need for health care is increasing rather than reducing. I hope that as our health service changes through the new Sustainability and Transformation Plans, which seek to integrate health and social care, that the need for continuing local care for elderly people in High Peak will be recognised. I can make no promises and I will not give any assurances that I cannot fulfil, but I will continue to argue the case for the excellent care provided at Spencer and Fenton wards. Thank you very much to all the staff who continue to give such high-quality care and who go above and beyond for your patients, even in such uncertain times.